Have you lost a loved one and experienced prolonged periods of uncontrollable grief ? Have you lost property in a sudden flood that hit your hometown and in a moment your life changed forever ? Maybe you have to deal with a difficult boss who is unreasonable and at the moment changing your job is not an option. There can be many such situations in life, which are beyond our control. People act in unexpected ways and they influence our lives often without our consent or approval. Coping with stressful situations that we are unable to change can drain energy and leave us feeling tired and confused. If left unchecked, ongoing stress may lead to depression, anxiety and other mental disorders. Everyone employs their own personal coping mechanisms to deal with situations, which one cannot change. We often have the ‘Why me?’ syndrome and wonder if there is an effective way to prevent these negative responses. How can we insulate ourselves from stress in those situations where we have no control ? How can we remain calm while facing the challenges and difficulties in life ? We may have tried to accept the situation in our own ways. However, due to the strength of the impressions (of personality defects) in the subconscious mind, we can struggle to accept it fully and let go. Often negative thoughts continue to loop in our minds dragging us back into the situation. This invariably leads to a feeling of helplessness and despair. So, is there a solution to face such situations where we feel powerless to change? 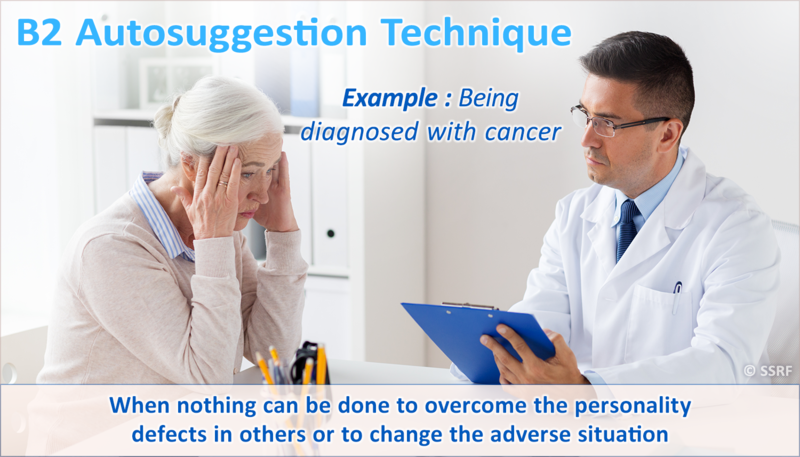 The B2 Autosuggestion which is a technique within the PDR (Personality Defect Removal) process, is meant specifically to overcome such types of reactions or negative responses. 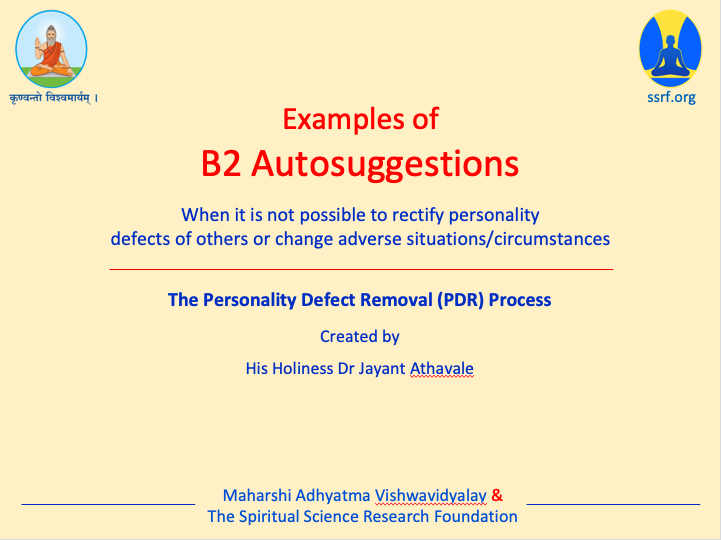 The B2 Autosuggestion technique is used when we experience stress or unhappiness due to mistakes committed by others and nothing can be done to overcome the personality defects in them or to change the adverse situation/circumstances. Or it is not possible to change the adverse situation/circumstances. 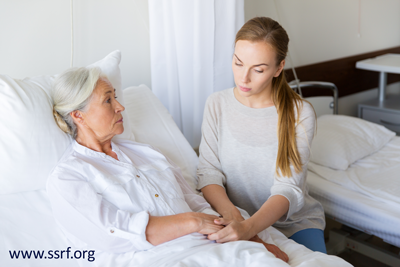 These can be mistakes made by elders who are not receptive to any corrections or some unavoidable tragic condition such as a close family member being diagnosed with a fatal illness, being faced with a natural disaster, etc. In such situations philosophical reasoning is given to the mind, which helps us to remain calm and accept the situation as it is. 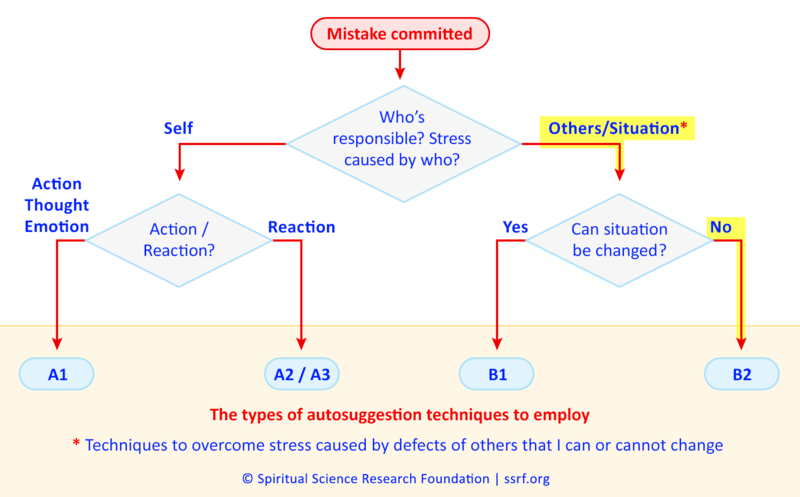 One point to note here is that even though the mistake or the situation happens due to the personality defects of others, a B2 Autosuggestion would address our reaction/response to the mistake/situation. So, in the Personality Defect Removal (PDR) process, the focus always remains on changing oneself. Through this process we endeavour to change our own thinking and reactions, even though another person or situation may have triggered the negative reaction. So, let us look at an example of a situation and how a B2 Autosuggestion could be drafted. The Autosuggestion starts with ‘whenever’ and then that part of the mistake comes which is the actual trigger (here it is being robbed of one’s valuables). This is followed by the philosophical reasoning that despite everything, our family is safe and that is the real blessing. Here, the realisation that family is safe helps to bring that relief for the mind that all is not lost. We can rebuild everything since the whole family is safe. Through such B2 Autosuggestions, one gains the strength to face challenging situations and remain stoic. The following flowchart shows us visually how we would know when to select the B2 Autosuggestion technique. Let us take a practical example of a situation/shortcoming which will help to understand when to select the B2 Autosuggestion technique. Referring to the flowchart above, the following are the questions we need to ask ourselves after such an incident or shortcoming happens (in this case a feeling of despair). This is in order to determine which type of Autosuggestion to use. Answer : In this situation the stress caused to Ellen is primarily due to the situation of her aunt (Alison). Answer : Here, it is Ellen’s emotional response (reaction) of despair due to her aunt’s cancer returning. Question 3 : Can the situation be changed or not? Answer : Here, the situation is unlikely to change as the doctors have said so. So, based on the above analysis, for this situation, the B2 Autosuggestion technique can be used. Two possible B2 Autosuggestions that can be used to overcome the feeling of despair have been provided below. Whenever I (Ellen) feel sad that my Aunt Alison has less time left, I will pray to God to increase my faith that He will look after her and I will calmly focus on chanting. Whenever I (Ellen) feel sad that my Aunt Alison has less time left, I will realise that this is the time to take care of her. So, I will look after her and cherish the time which I have left with her. Remember – Each incident involving others that causes a reaction or stress needs to be analysed to determine if it can be changed or not. 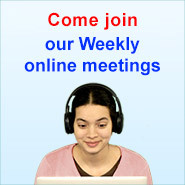 For example, Janice felt hurt when she called John to ask for help and he flatly refused. When John had needed help in the past, Janice had immediately gone to help. Now, if Janice is John’s boss at work and John has an attitude of not helping, then Janice can just tell John to behave properly and come and help. Here, since it is possible to change the person or situation causing the stress to Janice, then a B1 Autosuggestion should be used. However, if John is Janice’s grandfather who is moody and usually unwilling to help others, then it is unlikely that Janice could make her grandfather change his mind and help her. So in this scenario a B2 Autosuggestion should be used. By taking B2 Autosuggestions, it helps to sooth the mind in the face of tragic circumstances. The burden is lifted as acceptance comes for the things we cannot change and therefore it becomes a powerful antidote to face stressful situations and depressive thoughts. When used for daily situations involving other people, B2 Autosuggestions helps us to remain objective, detached and non-reactive, so we can easily go through the day. We are unaffected by the poor choices and negative actions of others that may have previously left us exasperated and resentful. About the major events in life, a B2 Autosuggestion provides a philosophical approach as we realise that many such events occur due to destiny. If a person is involved in a natural disaster and loses all of their material possessions, then that person is truly fortunate to escape with their life. Many people are unaware that destiny is the underlying cause of around 65% of what happens in our lives, including all major events such as marriage and death. This knowledge alone can help us take a more philosophical view by providing a spiritual reason for why things happen. Let us look at some situations where B2 Autosuggestions can be used. In these examples, nothing can be done to change the situation or the other person’s behaviour. 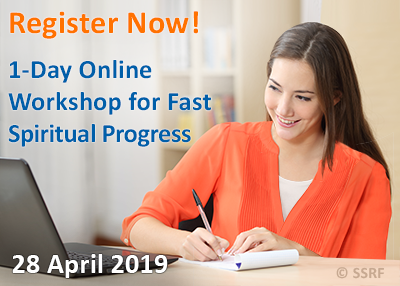 B2 Self Hypnosis Autosuggestions from SSRF Inc.
Best-laid plans can be derailed by unexpected life-changing events such as a serious illness, job loss or divorce. Life doesn’t always go as expected. There are only so many ways in which we can prepare for worst-case scenarios. We can have the best preparation in place and the best expertise, yet things do go wrong, and we are left to handle the situation. So, when best-laid plans fail, what we can control is our responses/reactions to different situations and our attitudes. But this is easier said than done. When faced with challenging situations, maintaining a positive outlook takes a lot of effort and courage but is possible with proper conditioning of our minds. B2 Autosuggestions are a solution that enable us to deal with all such situations we do not have any control over. Regularly taking these Autosuggestions helps to rewire the mind to accept that which cannot be changed. 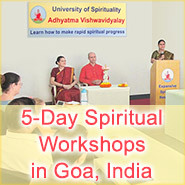 In doing so, one is able to experience a sense of calmness and stability.